Saturday, March 9.th, we were back in the small city Alta to start the 500 km Finnmark Race. The 8 dogs that started with me this time was the girls; Mille, Mie, Uxi. And the boys; Diko, Ginkgo, Buster, Koia and Mokke. I started out from Alta at noon Saturday. The first 50 km to Checkpoint Jotka (just a cabin where they note the time spent in the middle of nowhere) and the next 58 km to Checkpoint Skoganvarre went very well. Some wind and snow-showers on the last 40 km but nothing to worry about. I went carefully, and far from as fast as the dogs was able to. In the uphills I could just stand on the sled and relax, while the other mushers had to run to follow me. 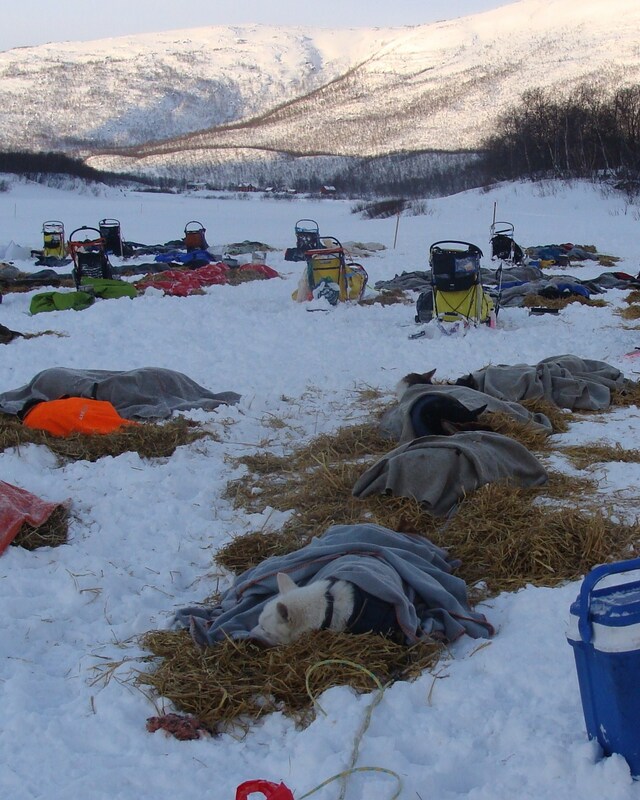 At Checkpoint Skoganvarre I decided to rest one hour more than planned because the forecast was pretty bad, and I wanted the dogs to be as fit as possible for what could be a challenging night. Half an hour before midnight I started on the next 78 km through the most rugged terrain in the whole race. After 40 minutes I was above tree level and up in the mountains. The next 60 km went with no more than 100 meters of visibility, and in the hardest parts down to 10 meters. North-West winds at 30 miles per hour with heavy snowfall made the trail dissapear. The trail was very well marked with wood sticks with reflektor-tape on. A few teams lost the trail and struggled to find the way back, but I had no such problems. I arrived Checkpoint Levajok on the border to Finland just after first light Sunday morning. The Veterinary team checked the dogs and everything was good. One of the best looking teams so far they told me. I gave the dogs food, gave them massages, and put them to sleep on a thick layer of straw, with blankets covering them. The team in Levajok. Sleeping on straw, under blankets. After having a meal and 3 hours of sleep myself I went back out to the dogs, gave them more food and checked them. I found that Ginkgo, my only white dog, was a little stiff in his muscles in his hind legs. The vet checked him, and said that it was a pretty good chance that he would warm up and get rid of that on the way to the next checkpoint Karasjok. I started out early Sunday afternoon. All 8 dogs still in the team. The trail was good and the temperature dropped on the way to Karasjok. The dogs ran very well and the last 50 km I had to slow them a bit down to prevent them from going to fast. By the time I arrived Checkpoint Karasjok it was -25°C on the river. Buster was barking, wanted to run full speed so I had to use the brake all the way, just like in the first part of the race. I was thinking to myself that the last to stages back to Alta would be really fun with this dogs if this continued. As I arrived Karasjok and stopped there, I could see that Ginkgo was getting a bit stiff in his muscles again. He was running perfectly all the way on the river, but now I knew I had to leave him to my handlers before the next stage. This condition is nothing to worry about. In a couple of days he would be back in business. However, this race was over for him, and the rest of the way he would have to spend in the car. The Checkpoint is up on a hill in the small town. The temperature there was far warmer, only -10°C, perfect for the dogs. The vet checked my dogs, and found that both Diko and Uxi had a bit swollen wrists. Uxi was also a bit stiff in her right side triceps. Mille was also getting a bit stiff in her hind legs. Koia, Buster, Mokke and Mie was in perfect condition. I realized that I had to leave Mille and Ginkgo here, and worked a lot on the others to get them fit for the next stage. I also decided to rest 2 hours more than planned, With 6 dogs it is no problem to reach the finish line. After massaging, putting in som heat creme, wrist warmers and giving the dogs extra rest I went out to check them again. 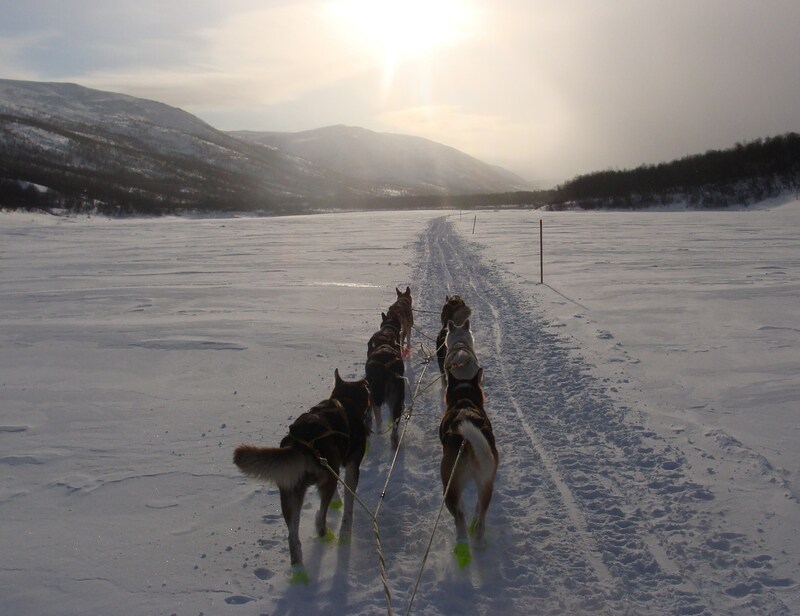 I got the vet to recheck them and he said it was a 50% chanse that both Uxi and Diko would warm up and be ok for the next stage, but I also risked to get one of them in the sledge along the trail. I decided to quit the race there. Maybe I could go to Checkpoint Jergul with 5 or 6 dogs. It was a chance that I would reach the finish line, but I would also risk that one, maybe both would run with pain so I told the vet and the race marshall that I would stop there, becouse my dogs are more important for me than the race and the glory of getting through. I also want the dogs to remember the race as a good experience, and have good memories from the different places along the trail. It is a sad moment when you realize that what you have worked hard for in the last 9 months, spending £ 5.000 on, and countless hours on, just disappear in a rather boring car-drive back to Alta. Allready two days after the race, all the dogs were back to normal. It was impossible to see that they ran 300 km in 36 hours. Allready on Wednesday I was out on a 15 km training. The dogs are ready for full training again. However, The Finnmark race was the last one for us this season. We don’t have economy or time for the last one, the Pasvik Trail in the beginning of April. Many teams had to quit the race this year. The reason was the conditions on the way to Levajok where the dogs lost the rhythm all the time. Snow drifted into the trail and made the surface soft. The dogs used a lot more energy. That combined with the very hard trail along the Tana-River to Karasjok, a trail you could drive a car on, made muscle stiffness. The rest of this winter and spring will be filled with some training, and many trips to the small lakes with big fish in the inland mountain areas. Hopefully the snow will last till June….